There is great value in observing nature rather than just reading about it. In the case of Bald Eagles, one can find conflicting information, often anecdotal, but probably valid in single instances. For example, it has been said that when the chicks are almost ready to fly, the parents begin to deprive the eaglets of food. The presumed survival advantage is that the fattened chick will lose weight, and thus become more proficient in free flight. 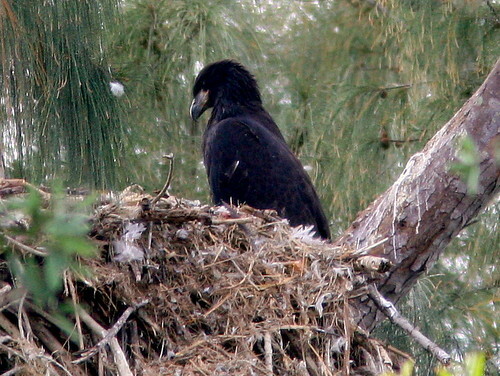 It is also stated that the parent may “lure” the eaglet out onto branches in an effort to get it to fly. 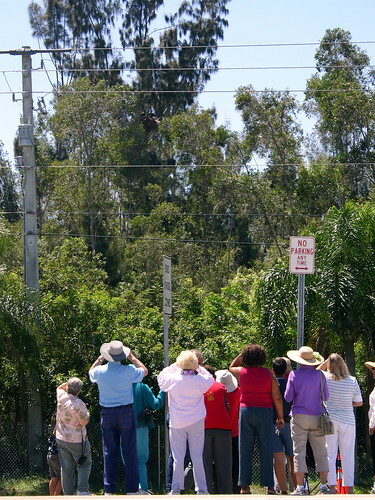 We have seen neither of these behaviors at our local Pembroke Pines, Florida nest. They climbed out on branches of their own accord. Both of the youngsters fledged at approximately 11 weeks of age, just as expected. In the days preceding their departure from the nest, we saw no decrease in the number of feedings or the size or amount of prey items. In fact, on April 5, 2009, the day after the older chick (Hope) fledged, the younger one (Justice) continued to be fed by both parents. He got so full that he did not even beg or cry out when, for the third time that morning, an adult brought in food . “(A)n adult flew to the nest without food. It landed and then Justice immediately grabbed one of its feet. The adult tried to pull its foot away many times, but Justice would not let go. Then, there was a real physical squabble between the two, with some screaming by both for a few seconds before the adult flew away. The younger chick’s personality also seemed to be undergoing a striking change. Justice was usually very passive in the nest, deferring to his younger sister at mealtime and just getting out of her way when she practiced “helicoptering” in the nest, even ignoring the indignity of being stomped upon and struck by Hope’s flailing wings. Now Justice appeared much more aggressive, yet strangely disturbed and anxious. The next morning we knew why. You may have seen Justice’s changed demeanor in Lou Greenwell’s earlier YouTube video that may be viewed at this link <http://www.youtube.com/watch?v=SBGRZmqrocY>. Driven by an instinct that he, and certainly we, cannot fathom, his body language communicated a wildness that seemed almost foreign to the “little kid.” Lou’s video captured the next few minutes, when we discovered the reason for the chick’s distress. At once longing for the freedom of the skies, and yet so inhibited by his fear of the unknown, we saw him finally take that treacherous leap, and we shared his disappointment and pain as he seemed to plummet to the ground in failure. 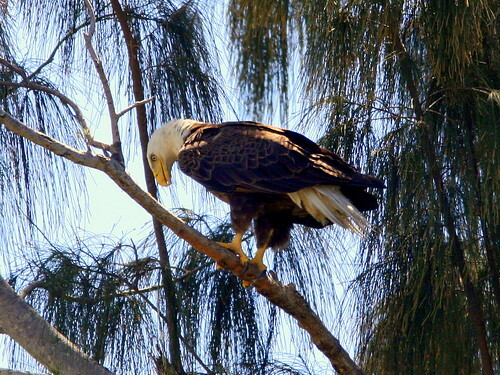 Our first-hand observations also document a behavior that, while not unusual, is not prominently described in many accounts of the Bald Eagle’s life history. Commonly, we read that the chicks, after fledging, tend to remain in the vicinity of the nest and beg for food for several (or about 6) weeks. Rarely do we find mention that the young actually return to the nest itself. For the past week, our local fledglings have both been found feeding and resting on the nest many times, often together. 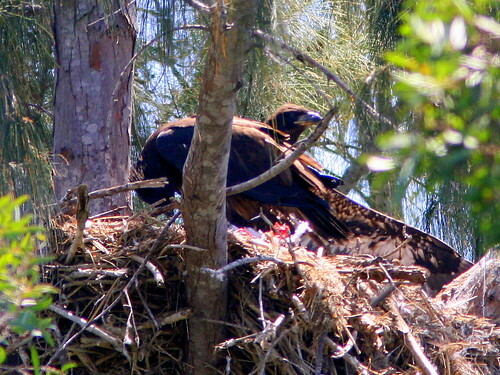 The adults continue to drop food in the nest, even if the young birds are not in sight. It will be interesting to see how long they follow this practice. To read many up-to-the-minute reports on the status of the eagles, be sure to visit the FORUM.